WKCR's Honky Tonkin' program celebrated its 10th anniversary last week with a marathon live performance featuring many of the great players who've guested in NYC's only live-radio country music show. Fran Leadon was there and took a bunch of photos, which you can see in the Ponkiesburg group on Flickr. Check them out, and thanks Fran for taking them! Join the group while you're there, and contribute any photos you might have. A couple of weeks ago we threw a curve ball at the Sunday jammers. Katie Dixon called in the morning and said the parking garage she'd used for the all-day Downtown Hoedown was available and would we want to play on the roof? So I sent out a last-minute email, left a note at the bar, picked up Doug and Glenn, and headed over there. Luckily enough pickers got the note or saw the email that we had a really wonderful jam. Best of all, some intrepid visitors from London followed the clues and joined us. One of them, James Griffith, sent some gorgeous photos he took that day. Check them out. It all started on Friday night when Rafe and Clelia Stefanini brought Ashokan to Red Hook, with a great night of fiddle tunes and offers of marriage (much to Clelia's surprise, I think). It continued on Sunday afternoon with Don and Emily's harmony workshop, but unfortunately I couldn't be there. However I was there for Kenny Kosek and Marty Cutler on Sunday night, which somehow managed to combine fiddle tunes, a laptop computer, and what I believe was Godzilla's stage debut at Jalopy. 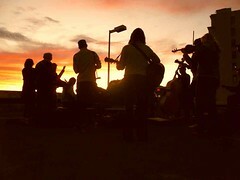 And this weekend will be no different, although in a somewhat different genre -- Jalopy hosts the two-day Django festival followed by a washboard workshop on Sunday. Tonight, Sean Kershaw is doing his weekly gig at Hill Country, the Sheriff will of course preside over NYC's longest-running bluegrass and old-time jam, and there's music all over Brooklyn -- gypsy jazz in Park Slope, western swing in Red Hook (as a matter of fact, I believe Sunny's is just about the farthest west you can go in Brooklyn), and various roots and rucki in JAB, which is what I just decided to christen the neighborhood Just Above the Battery tunnel. 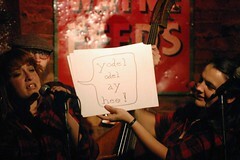 Thursday night, Boo and Elena host the 2nd annual Mandolin Festival. Everyone will be there. Just go, and settle in for a long and amazing night. 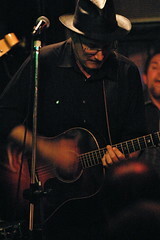 Friday, John Pinamonti plays Jalopy along with Rebecca Turner and the American String Conspiracy. Sunday, Harry Bolick runs a workshop on old Mississippi fiddle tunes and believe me, he knows those tunes, and all their weird and wonderful rhythms. The Paddy Reilly's jam starts at 5, the Birdhive Boys play late at National Underground, and Ponkiesburgers will be picking and partying at Kili, starting around 5. 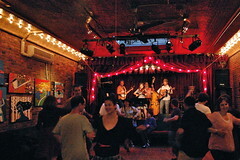 From there I headed down to Jalopy where M. Shanghai had the house full with their CD release party. There were so many people on stage it took three songs for me to notice Hilary Hawke sitting in with them. Guest stars, harmonicas and saws, and all the usual insanity. Then down to Sunny's for a happy-birthday to Edith and some good playing. 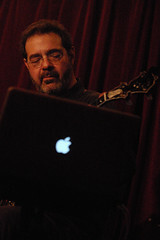 Tony Delillo was there along with another great young guitarist. Dave and Sarah were there so we had two harmonicas, Lenny didn't let a missing B key hold him back on the accordion, and Edith was of course in fine voice. And that was just one Saturday night. More photos here. I was honored to again join the Kings County Opry song circle last week. The Opry is in its sixth year now, and I think Dock has always opened it up with a group of songwriters playing their songs. I personally love the song circle format, both as a performer and a listener. First of all, you get to do both. I remember Lyle Lovett, who frequently performs like this with people like John Hiatt and Guy Clarke, saying once that his favorite part about those shows was having the best seat in the house to watch the other players sing. So, I did a few songs, and got to listen to Jeep Rosenberg's amazing songs (he had a line about things slipping away "like a lizard in a washing machine ... and things still aren't getting clean" that friends of mine are still quoting) and to Dock's always punchy songs, including one I hadn't heard before about going to Target with his girlfriend. If you can get a song out of that you can get a song out of anyone. And Jesse Miller, who brought his own songs to the circle last time I played, backed Jeep and Dock up with some beautifully tasteful guitar work. After that, the Gowanus Canal Hotshots took over the room. Shlomo inevitably has more instruments onstage than most bands do, while at the other side, Trip and Emily between them bring a few harmonicas, a banjo uke and then rely on the bottoms of their faces for just about everything else. It all adds up to a great time though. I wish I could have seen more of their set but I had to split early. But we got some good photos. Another big week of music. Head down to Sunny's tonight, and mind your knitting while listening to some Smokey western swing. Thursday night you (or, at least, I) will want to be in at least three places at once. I'm playing the song circle along with Jeep Rosenberg with Jesse Miller, and Dock Oscar with Anneke Meeker, followed by Sufferin' Succotash and Roosevelt Dime. So that's where I'll be. But you may be at Jalopy, where Hilary Hawke is celebrating the release of her wonderful new CD at Jalopy. It's all her own songs, and features lots of pickers you know and love including, of course, double-H herself. The Woes are also on the bill so it will be a rocking night. Or you may be across the river at Banjo Jim's, where the Bob Jones and Boo Reiners will be plunking and pitching their new CD, with Melissa Faith Cartoun opening. On Friday, Jonah Bruno's sister is in town with her band Dust Bowl Dreamers, playing an early show in the Lower East Side. He notes that they do not have a banjo player. We're not sure if he means that as reassurance, or as a hint he may sit in. You could walk from there to Googie's, where Kari Denis rejoins Kings County Strings for a night of music also featuring David Moore and Don't Tell Darlins. Or continue west to Ace Of Clubs where Rich Rosenblatt and company will be celebrating the fifteenth anniversary of the Prowlers. Or go to Brooklyn, where you could see The Woes at the Brooklyn Lyceum or Mattison at Sunny's. Saturday night the Sunny's jam will be a bit special -- Edith is celebrating her 22nd (or was that 88th?) birthday with food and, of course, some wonderful singing. Come down and celebrate with her and all of us at this wonderful bar on the edge of beautiful New York Harbor, into which the Hudson River also empties, a couple of miles away. :-) Mojo was there last week so hopefully we'll see him this week and can wish him well. 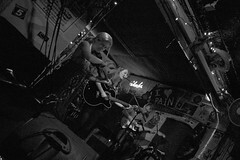 Also Saturday, Jamie Lyn's Honky Tonk Angels will be at Hank's, with a bunch of great bands as well as a song circle. Definitely a great Brooklyn night out. The jam at Kili will probably be sparse as will other events, given how many people are playing out. It's a great day, though. Finish the night back at Hank's again, where Sean Kershaw will be concluding his long residency there, or at National Underground with the Birdhive Boys at 11. Kari Denis put together a two-night Celebration Of Song at Jalopy, featuring a lot of songwriters who come from the local bluegrass/old-time scene, myself included. It was a lot of fun, not least because Andy Mullen kicked things off. He's not only a very talented songwriter but a great square dance caller, adept not only at calling the dances but herding hipsters into line and teaching them how to do it. Nothing tells you more about Jalopy than a room full of dancers and great music. More photos here. John's got, I think, half a dozen albums out now. They're all extraordinary, and mostly filled with his own songs. Two Saturdays ago, he celebrated his latest, filling Freddy's back room with friends, musicians, rocking music and good times. The CD, End Of Smith, is on CD Baby now so get your copy. "Ponkiesburg" was a Dutch name for the area of Brooklyn now generally known as Cobble Hill. 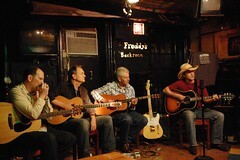 The Ponkiesburg Pickin' Party, held every Sunday afternoon, is one of the longest-running traditional acoustic music jams in New York City. This blog began as the weekly email newsletter for the Brooklyn jam scene (which is still published: sign up below) but now covers the scene in general, with photo posts and other news. Ken Ficara built the site and writes most of the blog entries and the newsletter.